Bribes. Corruption. Back Stabbing Rivals. All the interns you can handle, and the constant threat of impeachment. Race to become President and collect all four Federal Flags to win. One minute you'll be enjoying life aboard Air Force Once, the next thing you know your "Friends" and opponents are all trying to impeach you. 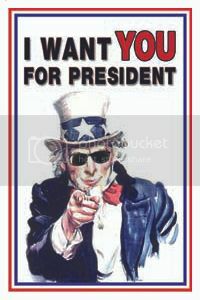 camPAIN the Game, it's all about Presidential Money, Power, Scandal and Fun. Two to Eight Players... the more players the more fun! Updated cards such as the Scandal Cards or Corner Cards can be updated every election season. This will help give camPAIN the Game longevity in the game market. 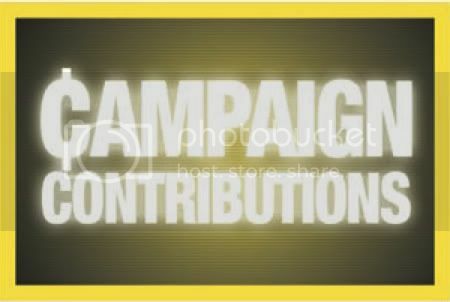 Your support will help get camPain the game out for the 2012 Campaign season. Thanks for your support and taking a look at my game. 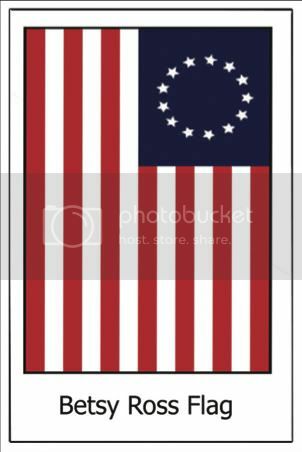 State Cards offer not only the key to becoming President in camPAIN the Game, but there is something to be learned when playing. (don’t tell the kids). 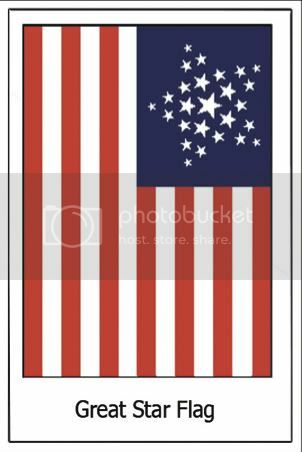 Every state card features the State flag, State Capital, Flower, ect. A few rounds a play and you’ll be surprised what has sunk in to you or the family. The best part of creating this game was the fun playing. Every little bit was enjoyable and fun. May you and your friends, family and political opponents have as much fun playing as we have creating it! Thanks for supporting my game. Help us reach 2012 backers, and enjoy our thanks and gratitude. Every dollar helps. Help us reach 2012 backers, and enjoy our thanks and gratitude. At this level you will be listed on our website as a lobbyist. Thank you for your support. 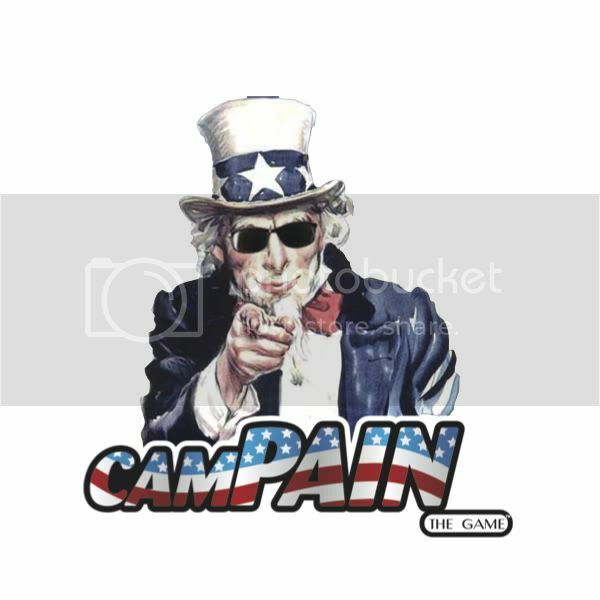 Show your camPAIN the GAME support this Campaign season with our camPAIN the Game Bumper Sticker. As a thank you for your support we will send one of our customized bumper stickers to you. You will also be listed on our website as a lobbyist. The Official 2012 Version of camPAIN the Game. Every Kickstarter Pledge includes One official game, One Bumper sticker. You will also be listed on our website as a lobbyist. Thank you for your support. As always free shipping in the continental USA add addition monies for Hawaii or Alaska shipping. Canada or Mexico Please add $37.50 Shipping per game. International deliveries please add $60.00 per game. 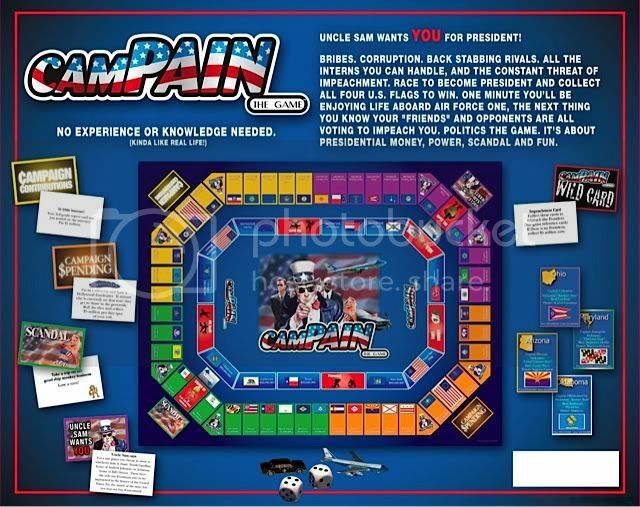 You get one official version of the 2012 camPAIN the Game and an addition set of specialty scandal cards that will be pro Republican cards with a few anti Democratic cards included. Also Included the camPAIN the Game bumper sticker. The Same great game with a decided Republican view point. You will also be listed on our website as a lobbyist. As always free shipping in the continental USA add addition monies for Hawaii or Alaska shipping. Canada or Mexico Please add $37.50 Shipping per game. International deliveries please add $60.00 per game. Democrat cards with a few anti Republican cards included. Also Included the camPAIN the Game bumper sticker. The Same great game with a decidedly Democratic view point, which is why it costs more! This way we can pay more in taxes! You will also be listed on our website as a lobbyist. As always free shipping in the continental USA add addition monies for Hawaii or Alaska shipping. Canada or Mexico Please add $37.50 Shipping per game. International deliveries please add $60.00 per game. Military Pac: Order the Triple Play Receive one official 2012 camPAIN the Game & Get Two additional Games that we will send to the Military division of your choice. Help those who need fun and distraction with a game in your name. Thank you for your generosity. Plus One Official Version of camPAIN the Game and Bumper Sticker. Thank you for your support. As always free shipping in the continental USA. In the event you wish these games to go over seas we will work with the appropriate division to see they are delivered. Where there are obstacles getting games to difficult bases, we will send them ourselves in your name. Thanks for supporting those who need some home scandal and fun. Write a Scandal Card for our Kickstarter Bonus Packs. You and the developer will plan (One Scandal Card) per pledge, based on mutual agreement with credit given on the Political Donor section of the Web Site. This will be Secondary Scandal Cards in addition to the current 2012 Version. As a major Donor your name will appear on our web site as one of the (Official Donors). 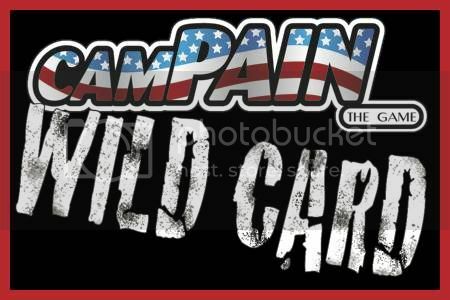 In the event this goal is not reached you will still be provided with the Limited addition cards, plus One Official Version of camPAIN the Game, plus both the Republican and Democratic bonus Scandal Cards and a Bumper Sticker. International deliveries please add $60.00 per game. Great for Fundraisers, Schools, Political junkies, or Radio Stations. Entertain 200 people on Election night, with the greatest new board game, camPAIN the Game event in your area. 25 Games, 8 Sets of Republican bonus scandal cards, 8 Sets of Democratic bonus scandal cards, 4 Posters, 25 Hats, 25 T-shirts, 200 Bumper Stickers. Shipping in USA only Please.